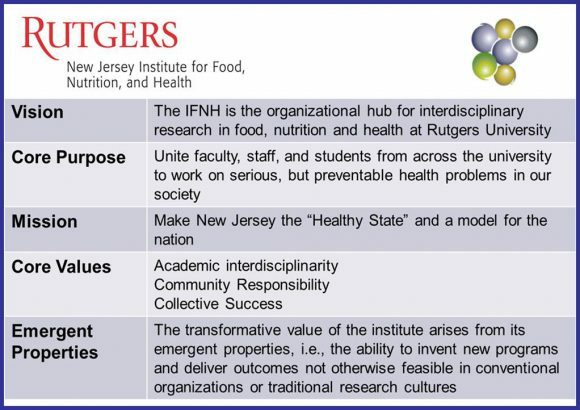 Share the post "Founding IFNH Director Reflects on a Remarkable Journey"
Which Rutgers president made the IFNH a “signature initiative” of the university? 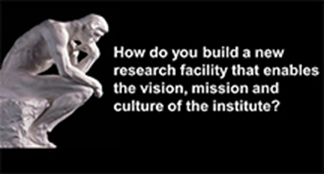 What organization provided the initial funding to build the institute? What was the project cost of the building? How many square feet is the building? Who has the largest office? Which Center is expanding its reach into the Big Ten Academic Alliance? Which Center now runs the largest conference of its kind in the Northeast? Who were first two assistant professors to be hired as resident researchers? 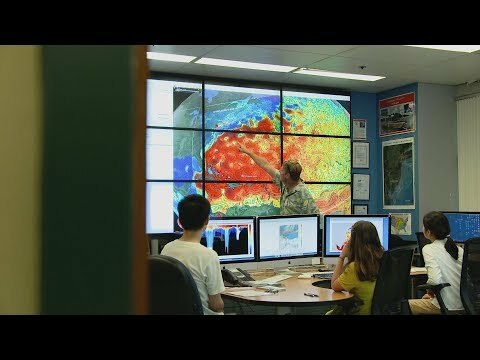 What is the value of the IFNH Endowed Research Fund? What is the current value of the institute’s grant and contract portfolio? On May 2, Peter Gillies, founding director of the New Jersey Institute for Food, Nutrition, and Health (IFNH) presented a Nutritional Sciences Seminar, “Reflections on a Remarkable Journey: The Founding of the IFNH.” Josh Miller, chair of the Department of Nutritional Sciences, hosted the seminar and introduced Gillies who began his talk with an IFNH history quiz for the members of IFNH and School of Environmental and Biological Sciences faculty that attended (see sidebar). As he approaches the end of his second term as director, Gillies’ reflections on the launch of the institution involve acknowledgement of the people and events that were fundamental to its development, maintaining a vision and philosophy, and lessons learned along the way. Starting with his personal life, with two scientists for parents, Gillies was immersed on a path of science at an early age. During his professional career, he found support in a group of mentors, who ultimately helped him make the decision to accept the invitation to become a founding director for an institute, which at the time, was only a concept. Gillies noted the complexity of creating an interdisciplinary institute and constructing a research facility that would enable that vision, and the importance of the funding and partnerships that allowed for its development. Presently, the IFNH has approximately 115 members drawn from nine schools and 28 different departments at Rutgers. Gillies pointed out that the key strategic question wasn’t about the design of the building as much as it was about the culture it was designed to foster–a culture of health, and of team-based, mission oriented research. 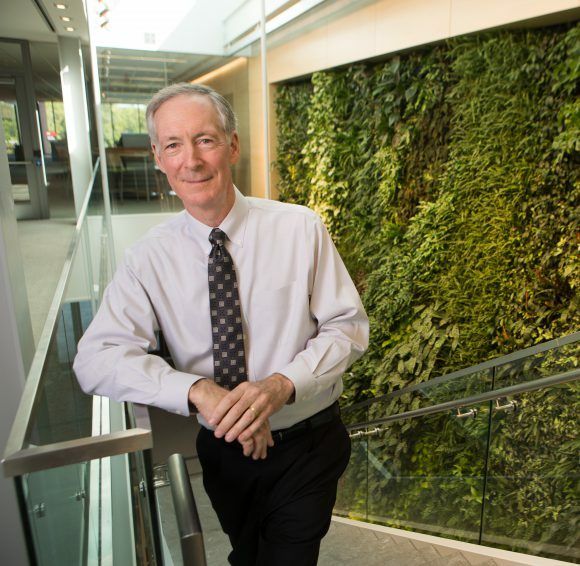 “Interdisciplinarity is messy business and it requires a different kind of leadership model if it is to really flourish–herein the built environment can really help make it work,” he said. The institute champions a culture based on three core values: academic interdisciplinarity, community responsibility and collective success. Collectively, these values shape the emergent productivity of the institute in terms of new and innovative programs. These support IFNH’s mission, which is to make New Jersey the “Healthy State” and a model for the nation. While some of the conceptual components of developing the broad-based institution can fit neatly into organizational models, Gillies emphasized that realistic representations are more aspirational and allow for the potential of growth and evolution. The IFNH subscribes to a paradigm of translational research that enables basic research to be validated in the clinic and reduced to practice in the community. In keeping with its focus on prevention, the IFNH pays particular attention to early life-cycle interventions as a strategy to keep children on a healthy trajectory into adulthood. The IFNH research centers and special services represent the operational core of the institute; they are enriched by multiple thematic programs. The four centers of the institute are: Center for Lipid Research, Center for Digestive Health, Center for Health and Human Performance and Center for Childhood Nutrition Education and Research. One of the recent thematic programs to emerge is the New Jersey Healthy Kids initiative, which is a partnership between IFNH and the New Jersey Child Health Institute. Gillies concluded with some career path advice that he adheres to: follow your passion, engage great mentors, and dream big.